For the year 2000, Marzotto has designed 2 new engines. 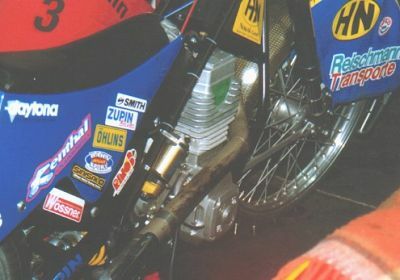 The first one is an engine to follow on from the type SRAF 97 and the engine has already been tested on longtrack by German rider Gerd Riss. As yet we do not have a good photograph of this particular motor, but the engine is easy recognizable by the extra cooling fins on the rockercover. The other new engine is a special engine designed for iceracing. This engine is a SOHC with only 2 valves and it too has been tested, this time by the Russian, Slawa Nikulin. Gert Bos from the Dutch Baansport site (see Links Page) spotted this motor in Berlin (See Right) recently mounted in a TIBO frame, these frames being made in the Netherlands by iceracer Tjitte Bootsma. At the moment, we do not have the Technical specifications of this engine but hope to acquire them before long.